Why a LifeBreath HRV System? LifeBreath is a leader in indoor air quality management, and have over 30 years of experience in the industry. Breathing fresh, clean air in your home is the way to a healthy home. The core of a LifeBreath HRV system is the six side performance that is offered by the unit. By working together they combine a product that offers durability, quality, and efficiency. The six sides of LifeBreath’s performance begins with Environmental Responsibility, Maximum Heat Transfer, Lifetime Warranty, Ease of Maintenance, Maximum Airflow Design and Durability in All Climates. The compact, electrically – powered Heat Recovery Ventilators (HRV) move stale, contaminated, warm air from inside the house to outdoors. At the same time, they draw fresh oxygen-laden air from outside and distribute it throughout the house. Stale, polluted air is constantly being replaced by an equal quantity of fresh clean air. As the two air streams pass through the unit they do not mix. They pass on either side of an aluminum heat-exchange core which transfers heat from the outgoing air to the incoming air. The efficiency of the Lifebreath HRVs is so great that virtually none of the warmth collected from your home is lost to the outside. In summer, the HRV’s work in reverse – removing heat from the incoming air and transferring it to the outgoing air, to keep your home cool and fresh. Lifebreath Heat Recovery Ventilators are available in MAX Series, suitable for retrofit installations and the RNC Series for the construction industry. Patented design, highly conductive aluminum transfers maximum amount of heat to the incoming air. Automatically increases air exchange rate when humidity rises. No more weeping windows. Protects the heat exchange core. Just rinse and replace. As our homes become more energy efficient, they become more hazardous to our health. The problem? Allergens and harmful indoor fumes from paint, plastics, carpets, adhesives, and household products stay trapped inside today’s tightly sealed, well-insulated houses. Although you’re saving money by conserving energy, you’re paying a much greater price with your health. Polluted indoor air can cause respiratory irritation and worsen allergy symptoms for everyone inside. It’s a risky tradeoff and one that can be avoided. The LifeBreath Heat Recovery Ventilator (HRV) makes your home a healthier environment by replacing polluted, stale air with fresh, clean air from outside. The Lifebreath Clean Air Furnace heats your home with maximum efficiency and provides the additional benefit of heat recovery and a delivery system for air conditioning. You breathe better air indoors and enjoy the financial benefits of an energy efficient home. 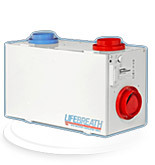 The Lifebreath TFP-Air Cleaner cleans the air in your home removing airborne particles. Take a few moments to learn about the dangers of poor indoor air quality, and see how LifeBreath’s range of products can improve the health of your home. Contact Tankless Experts Inc. About Your NEW Ventilator Addition Now! Get a HRV System Now!